Arrrrrrr! Shiver me gobbler. Happy Fourth of July. 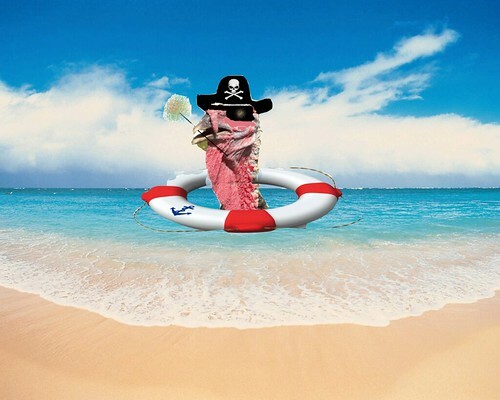 It’s none other than yer favorite pirate turkey of lore and yore, Planksy, the indomitable, gobbler-swaying bird of wiles, wit and beauty. Aye, I be shipwrecked here on the shore of the Oklahoma River after a nasty Poseidon trick or two, lads and lasses, but me bearings have been located, a new pirate vessel is under construction, and I’m ready and willing to dole out this year’s sparklers and sharklers. Arrr! Those who get the sparklers, well, join me in some rum drinking and hornpipe dancing on shore this year. (Bricktown. Take I-40 and try to find an exit down here. I think the scurvy rascals put it in Yukon.) Those who get the sharklers, well, aye, it’s time to take a little swim with me hungry fishies. Sharklers: Aye, me first sharklers of the year go to Gov. Mary Fallin, a land lubber, pirate wannabe, a lily-livered leader with scurvy policies and positions. So she denies poor people here health insurance, it’s true, she won’t require storm shelters in schools to protect the young lads and lasses, aye it’s true, and she doesn’t believe in equality for our LGBT friends. Avast, me fellow pirates, she wants the state’s treasure delivered to the richest rascals aboard a ship of fools. They say she’s literally got no heart, but them fishies don’t care. Take a swim, Mary, take a swim. Arrr! Sparklers: Me very first sparklers go to Oklahomans For Excellence In Science Education for all the fine work opposing religious intrusion. Some polys and land lubbers want to attack evolution and other scientific theories in schools as if Planksy himself isn’t a Darwinian testament to evolved creatures everywhere, but, nay, OESE calls out the scurvy bilge rats for what they are and what they want. Arrr! OESE, here’s to you, cups of rum for all, the Jolly Roger flies high in yer honor, let the hornpipes play and the dancin’ begin. Shiver me gobbler, me fellow pirates, victory feels good. Aye, just be ready next year when the land lubbers play their swarmy hand again. Sharklers: Arrr! Aye, next up for some toothie fishes is none other than Attorney General Scott Pruitt, who’s been in a tizzy wizzy suing the federal government and wasting yer taxpayer money on scurvy ideology. Aye, Pruitt must dream about Obamacare each night he’s so fixated. His barnacle-encrusted political views dictate his slimy, inglorious legal shenanigans. His legal fight against the federal Affordable Care Act is an obsessive act of land lubbery and swarmy fallaciousness and a curse to all true pirates. For ye, Mr. Pruitt, a swim with the toothsome circulars, if ye get me drift. Be quick about it, sir. Sparklers: Aye, he’s known in all the lands and seas of the earth, and his gobbler makes him a heartthrob to fowl and human alike. He’s keen on logic, and he’s a seasoned seabird on a journey for treasure, riches and the common good. He’ll even give his rewards, good or bad, when he’s shipwrecked and temporarily at port. Aye, sparklers to meself, Planksy, who wishes you and yours a happy and safe Fourth of July. Arrr!